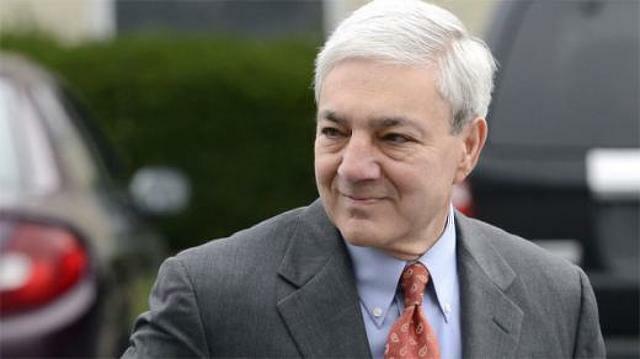 Former Penn State President Graham Spanier filed a motion Monday seeking to have his child endangerment conviction thrown out. His attorney, Sam Silver, asked Senior Judge John Boccabella to acquit Spanier or order a new trial. Spanier, 69, was sentenced on June 2 to two months in county jail, followed by two to 10 months of house arrest with electronic monitoring. He also received a fine of $7,500 and 200 hours of community service. He was convicted in March on the misdemeanor charge while being acquitted of a felony child endangerment charge and a conspiracy charge. He, former athletic director Tim Curley, and former senior vice president Gary Schultz were charged for their handling of a 2001 report by former Penn State football assistant Mike McQueary of seeing Jerry Sandusky with a boy in a locker room shower. Sandusky, a former Penn State football defensive coordinator and founder of the now-defunct Second Mile charity for at-risk youth, was convicted in 2012 on 45 counts related to child sexual abuse. All three maintained McQueary did not report having witnessed sexual activity. They elected to tell Sandusky not to bring children to the locker room and inform the director of the Second Mile of the incident, but not inform child welfare authorities or law enforcement. In the new motion, Spanier argues that the charge is barred by the two-year statute of limitations for child endangerment and prosecutors presented no evidence related to the count as having occurred after Nov. 1, 2010, two years before he was charged. Prosecutors had contended that Spanier committed the child endangerment through an ongoing "course of conduct" in not reporting Sandusky over the 10-year period between when he was made aware of McQueary's account and when Sandusky was charged. But Spanier was acquitted at trial of the felony charge of child endangerment through course of conduct. "The jury thus rejected the only argument the Commonwealth has ever made that its prosecution of Dr. Spanier on Count 1 is not time-barred," Silver wrote. He also argued for acquittal on the grounds of insufficiency of evidence. The Commonwealth did not prove that Spanier had a legally-defined duty of care for the children abused by Sandusky, Silver wrote. Prosecutors assumed a duty of care because Spanier was informed about Sandusky, Silver argued, but according to statute, Spanier did not have a legal duty. "No evidence was presented at trial that Dr. Spanier had any contact with the minor children who were Sandusky's victims," the motion stated. "Nor was any evidence presented that any of these minor children were entrusted to Dr. Spanier's care, supervision, education, training or control." Silver also was critical of Boccabella's decision to reinstate a conspiracy charge that had been tossed by Pennsylvania Superior Court in 2016. Prosecutors had argued that the dismissal by Superior Court was for conspiracy to obstruct justice and commit perjury, charges against all three that the court also dismissed. Because the child endangerment charge remained, they said, the conspiracy charge on that count should remain as well. Silver wrote that Boccabella erred in reinstating the charge because it had been a single count and was dismissed by Superior Court. Even though he was acquitted of the count, its inclusion "greatly prejudiced him and likely affected the jury's verdict" on the child endangerment charge, Silver argued. Boccabella also erred in not providing complete instructions to the jury by not fully explaining the elements of the child endangerment charge and what is required for a guilty verdict, Silver wrote. He added that Boccabella used language from the 2007 version of the statute, which came six years after Spanier received the report. If a new trial is ordered, it should be limited to the misdemeanor charge of child endangerment, Silver said. Curley and Schultz both pleaded guilty in March, before they were scheduled to go on trial with Spanier, to one misdemeanor count of child endangerment. Curley, 63, was sentenced to three months in jail followed by four to 20 months of house arrest. Schultz, 67, received two months in jail followed by three to 21 months of house arrest. Both were fined $5,000 and received 200 hours of community service. All three are to report for incarceration by July 15.